The Morkie breed, a cross between a purebred Maltese and Yorkshire Terrier, is by far one of the most adorable toy dogs you’ll ever see. Due to their parentage and sweet appearance, the Morkie is often referred to as a “designer dog.” Even with given a glamorous and elite status as a designer dog, the Morkie is definitely a breed your family with children can fall in love with. 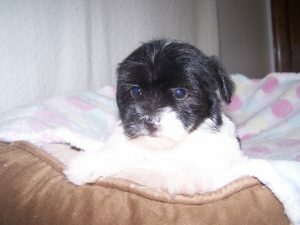 Breeders typically stick to breeding only purebred Maltese and Yorkshire Terriers in order to produce the hybrid Morkie. With being a hybrid and having purebred parents, the Morkie has less chances of developing a lot of hereditary diseases. Plus, a bred hybrid Morkie is much healthier and has an easier temperament. The average lifespan of the Morkie is 12-15 years. Purebred dogs often have an increased risk of genetic defects and problems down the line, but since the Morkie is a mixed breed, their risk is decreased and thus, their lifespan increases. With a small stature and “toy” appearance, the Morkie is simply irresistible. They are on the low-shedding scale and their coat is very easy to maintain with minimal grooming including brushing and washing. The playful temperament of the Morkie is ideal for families with small children. With plenty of affection and loyalty to give, the Morkie makes owning a dog an absolute joy. For proper socialization, it’s recommended to begin training early. Right from the start training also allows the Morkie to adapt to new surroundings quickly. As part of the toy family for smaller dogs, the Morkie is a delight for any owner to have. If you need any additional information on the Morkie, be sure to contact Pauley’s Pups.